The chef picked up the nubby stick of fresh wasabi. Through a translator, he explained the good ones are straight and deep green in color. It was the first time I had seen it fresh. The green dab you get at most American sushi restaurants is almost always horseradish and food coloring squeezed from a tube. While that may have been my introduction to freshly harvested wasabi, it wasn't my first time seeing something far more precious — Pacific bluefin tuna. 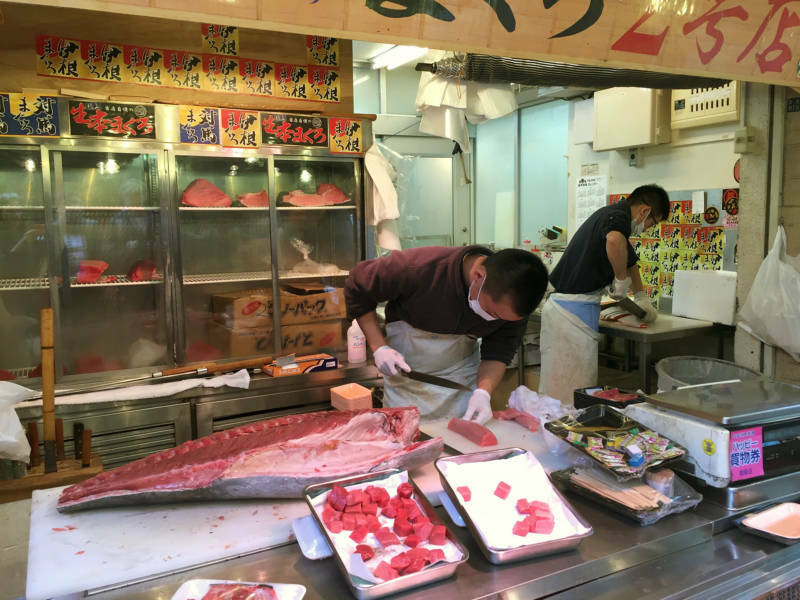 We skipped the early-morning tuna auction on our recent breakfast tour of Tokyo's famous Tsukiji Market, which we purchased as part of our vacation in Japan. I figured the frozen carcasses would leave me feeling gloomy. The bursting seafood mecca has plenty of other things to see and is just as chaotic as you'd expect. For just over 80 years, it's been drawing global tourists to central Tokyo to gawk at every kind of fish imaginable: tunas, mackerels, sea urchins, sardines, eels, halibuts, octopus, oysters, even bloody hunks of iced whale meat. This is the same market where the first bluefin tuna sale of the year has been known to go for astronomical sums. The high price is part tradition, part marketing ploy meant to grab headlines and generate a buzz for a buyer's restaurant or shop. In November, Tsukiji will be moving to its new home on a spot of reclaimed land on Tokyo Bay, which is why we were touring the market now — before this bubbling, vibrant version of it (perhaps like the bluefin tuna sold there) is gone forever. The future for Pacific bluefin is anything but bright. Late last month, new projections from the International Scientific Committee for Tuna and Tuna-like Species in the North Pacific Ocean showed the prized fish is at just 2.6 percent of its original levels — down 97 percent from where it once was. "Since the early 1900s, Pacific bluefin had been caught without limits," says Jamie Gibbon, a tuna expert with Pew Charitable Trusts. "They could catch as many fish as they wanted." Nobody even realized how depleted Pacific bluefin stocks had become until just four years ago, when the first public stock assessment was done. Andre Boustany, a research scientist and bluefin expert at Duke University, says the fish simply wasn't on anyone's radar. He, too, was surprised to discover the stocks were in such bad shape. "It's one of the greatest failures in tuna science/management that Pacific bluefin tuna weren't given a full assessment prior to 2012," he says. It's a fish beyond many Americans' price range. An appetizer portion of bluefin tuna sells for $32 at some high-end restaurants. It's tender, fatty and more flavorful than its yellowfin cousin. It isn't cute or fuzzy. There are no adorable Pacific bluefin memes or clever GIFs winning the Internet. If it vanishes from the ocean, it isn't going to interrupt most people's weekend plans. Except that this fish matters. It's an apex predator. That means it's at the top of the marine food web. "They reflect the health of the overall ecosystem," Gibbon says, and removing it from the food web will "send ripple effects throughout the ocean." But there's another important reason to care about what happens to Pacific bluefin. The organizations that manage them also manage the tunas most Americans do eat: the kind that come in a can or are found topping your favorite ahi tuna roll. Indeed, the hand-wringing has already begun for bigeye tuna, whose numbers are down to 16 percent of unfished levels. Barely a few steps beyond the stacks of fresh wasabi, I caught sight of a bluefin tuna's giant head: Its mouth was open, tiny teeth pointed toward a sliver of blue sky above the cramped stall. It had already been severed from its once-speedy torpedo body, itself a marvel of evolution. With quick, skillful cuts, the vendor drew a curious crowd. They leaned, pointing and commenting as he sliced the tuna's soft blue-red flesh from its silvery gray carcass, eventually passing a tidy package to our guide. I had stopped to watch him work, too, not realizing a piece of the prized fish was meant for us. I cringed. As a journalist who has covered seafood extensively for years, I'm keenly aware of concerns over dwindling Pacific bluefin populations. It had been far more than a decade since I purposely put a piece of bluefin into my mouth. This particular fish had been plucked from the waters off of western Mexico, then air shipped to Tokyo, where I now stood watching it being sold piece by piece to eager customers. There was a time when both Atlantic and Pacific bluefin were plentiful. I often joke that my dad traded me to my husband for a bluefin tuna. While we were still dating, my husband caught one with friends off the coast of Cape Cod and lugged several iced pounds of it in a cooler on the plane to my parents' house in the middle of Iowa. All in the hopes of making a good impression. This was long before grocery-store sushi, and he had no way of knowing that my father had traveled extensively in Japan. Pulling back the cooler's lid, my dad had clapped his hands loudly, rubbed them together, and made a beeline for the pantry for a tube of wasabi and a new bottle of soy sauce, creating a sashimi feast for my siblings and me. Husband got the blessing he was looking for — we were married a year later. But on this day, 25 years later, on the other side of the world, he and I had circled back to bluefin. Only this time, there was no joy in the tuna sashimi. 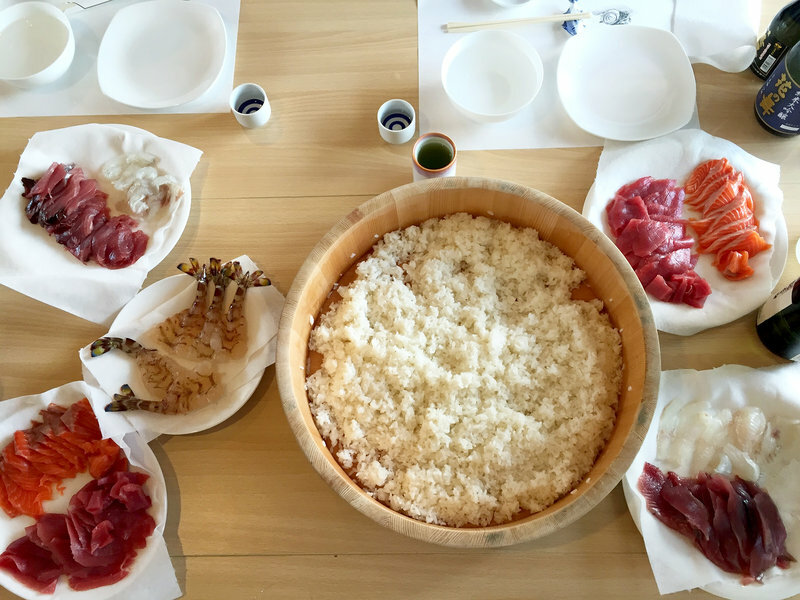 After gathering the rest of our supplies — a piece of wild salmon, a live flounder, live prawns and some chilled sake — we followed the chef up a flight of tight stairs to a small, quiet kitchen. There, he taught us the proper way to clean and cut a fish, and how to press seasoned rice in our wet hands before marrying it to the fish for a breakfast of nigiri. There was no point protesting. The bluefin was already plated. The language barrier meant any meaningful discussion about the fish would remain unsaid. I wet my hands, coaxed the rice into its proper shape, dabbed it with freshly grated wasabi, and gently put a slice of bluefin on top. I closed my eyes, took a moment to thank this fish for its life — and swallowed. I'd like to think that I didn't eat a doomed species. There's certainly reason to be hopeful. Pacific bluefin and other tunas have something important going for them: They're valuable. We have more than an ecological incentive to keep them swimming — we also have a financial one. In a recent report, Pew puts the global value of tunas at $42 billion. That's more than the gross domestic product of at least 108 countries. As a new report by the University of Washington points out, actually enforcing established catch limits may be the fastest, most effective way to rebuild tuna stocks. "If we allowed stocks to rebuild, we could have much higher quotas," says Boustany. "Higher population levels would make conservationists happy. The higher quotas would make fishers happy. And the lower chance of stock collapse would make managers happy. If we allowed the stocks to recover, the fisheries could be making a lot more money." While I'm hopeful Pacific bluefin will eventually recover and become plentiful again, I can't help but wonder what my daughter's future suitor will bring to win our favor: a flavorless tilapia raised in a mucky pond on the other side of the world, or a cooler full of prized bluefin — a fish worth celebrating on its own.